This entry was posted on October 28, 2014 by Posturite. The Agile Stand offers two impressive functions. 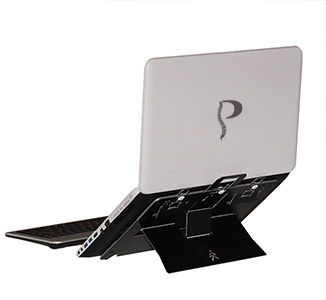 Rarely has a product been more appropriately named than the Agile Laptop Stand from the Ergonomic Café. Winner of the 2014 FIRA Ergonomic Excellence Award, the Agile (£59.99, ex-VAT) provides a perfect ergonomic interface between you and your laptop. Designed to fit almost any laptop of 15” and over, and to transfer easily to another laptop, this innovative product offers two impressive functions. First is the option to deploy the ‘Smart Type’ arms which slightly raise the rear of the laptop to improve the viewing and typing angles for direct use of the laptop. Secondly, the stand’s ‘Smart Set’ system offers four higher angle settings for use with an external keyboard and mouse. Once you’ve chosen the setting that best suits your personal requirements, each time you pull the ‘Smart Set’ handle the stand will automatically deploy to your chosen setting. Weighing in at just 225 grams and capable of being folded flat, the Agile is also easily transportable.